On May 7, 1915, the Cunard ocean liner Lusitania was torpedoed by a German submarine U-20. The ship went down in 18 minutes, 11 miles from the coast of Ireland. The vessel's demise was compared to that of the Titanic, sunk after hitting an iceberg just three years before. Both ships were the largest in the world at the time they were launched (Lusitania in 1905, Titanic in 1912), both were considered luxury liners (at least for their first-class passengers), and both sank with enormous loss of life — 1,198 on the Lusitania, 2,223 on Titanic, in each case about 68 percent of the persons embarked. On Feb. 10, 1909, 25-year-old Reginald Purse, former resident of London, sailed from Southampton, England. Purse's occupation was listed as "artist," and his final destination noted as Chicago. But in 1913, Purse appeared in Chattanooga. He worked as an "illustrator" at Purse Printing Company, and in 1914 as a "cartoonist" at the same business, where he was employed into 1915. It is unknown, but likely, that he had a family connection to the business' manager, Robert P. Purse. Each of those three years, Reginald Purse was listed in the Chattanooga City Directory as living at a different address: 218 Cherry in 1913, 517 Mabel in 1914, and 502 Georgia Ave. in 1915. Purse's most recognizable work was "Chattanooga and Surrounding Battlefields," a relief map showing 1913 Chattanooga with the battlefields of 1863 marked with numbers and corresponding points of explanation. Purse's wife, Gertrude Alice Hunt, (he called her "Gertie"), was also from England and lived with him in Chattanooga. She became homesick however, and the couple planned to return to England in the spring of 1915. At that point, World War I was still in its first year, and the German government in February had declared the waters around Great Britain a war zone. Purse and his wife recognized the danger. On April 17, 1915, he wrote a letter with instructions on the disposition of his property "in the event of any fatality befalling Gertie and myself, either at sea or on land, on our journey home." The Purses were reported to have carried with them a number of paintings which they "prized very highly" and intended on leaving in England. On May 1, 1915, the day the Lusitania sailed from New York, the German ambassador in the United States published a warning that all ships sailing into British waters were subject to attack. Flyers were distributed dockside with a similar warning. The Washington Examiner of May 1 reported: "Cunard line officials laughed at passengers' fears, and said the Lusitania could show her heels to any submarine. Despite the warnings, the Lusitania carried the largest number of passengers for months. She broke all previous records for number of second cabin travelers." The Purses sailed second cabin. But the Lusitania did not have the advantage of speed of which its owners boasted. At the outset of the war the Cunard line had deactivated six of the ship's 25 boilers to save coal and labor, reducing her top speed from 25 to 21 knots. On the day of the encounter, the captain reduced speed further to 18 knots to delay his ship's arrival at Liverpool tocome in immediately on the tide, rather than lingering off a major port in likely submarine hunting ground. In addition, many of the ship's experienced sailors had departed to join the Royal Navy, which hurt the ship's efficiency. Even though the Lusitania was a large ship, explosions following a single German torpedo strike sent it to the seabed in 18 minutes. There was speculation that the torpedo set off war supplies being secretly carried in the ship. A more serious problem may have come from the design of the ship's coal bunkers, which ended up pushing water to the damaged side of the ship, causing a sharp list and making launching lifeboats at first difficult, then impossible. There is no account of Reginald and Gertie's demise. 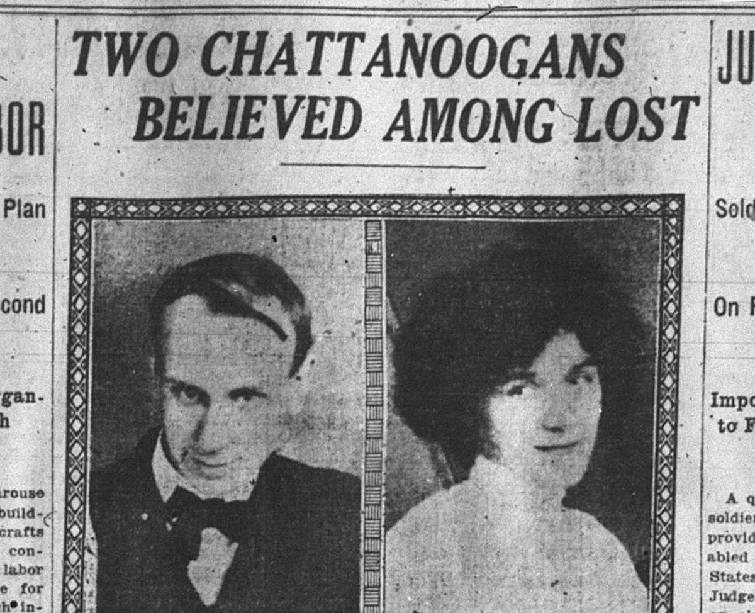 The Chattanooga News reported that though "Mr. and Mrs. Purse were quiet people, not mixing around much, they had many friends here, and these are scanning the newspaper reports for some word of the safety of the Purses." That word never came. Sam D. Elliott, a local attorney with Gearhiser, Peters, Elliott and Cannon, is author of a new biography of Confederate Gen. John C. Brown. For more information, visit Chattahistoricalassoc.org.